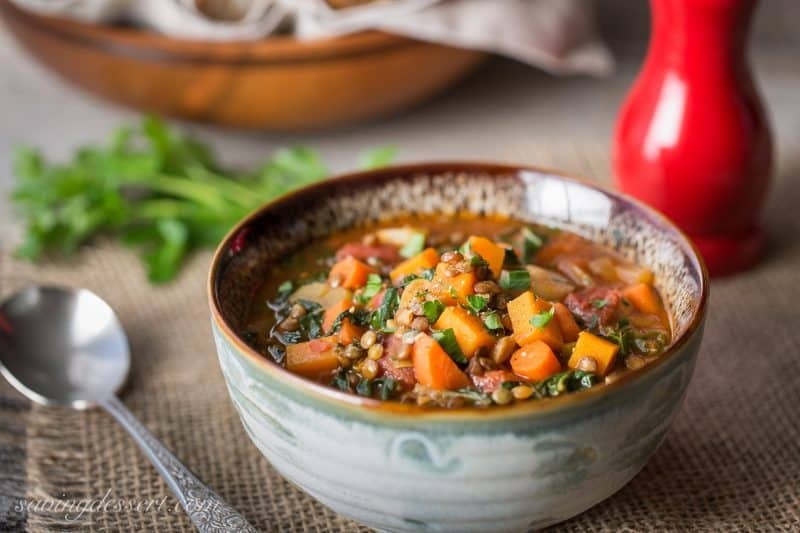 This is what I crave lately … a hearty rustic soup loaded with vegetables simmered in a rich flavorful broth with wilted seasonal greens and lentils. There are so many varieties of lentils available but this French variety (I used Bob’s Red Mill) hold their shape amazingly well. Lentils are a nutritional powerhouse full of fiber and protein and boast an impressive amount of folate, iron, phosphorus and potassium. Lentils make a great addition to most any soup, chili, and even salads. While we (sadly) try to avoid bacon and other processed meats, I do miss the smokey flavor it adds to a vegetable dish. Did you know Smoked Paprika is a great spice substitute for smokey bacon flavor? 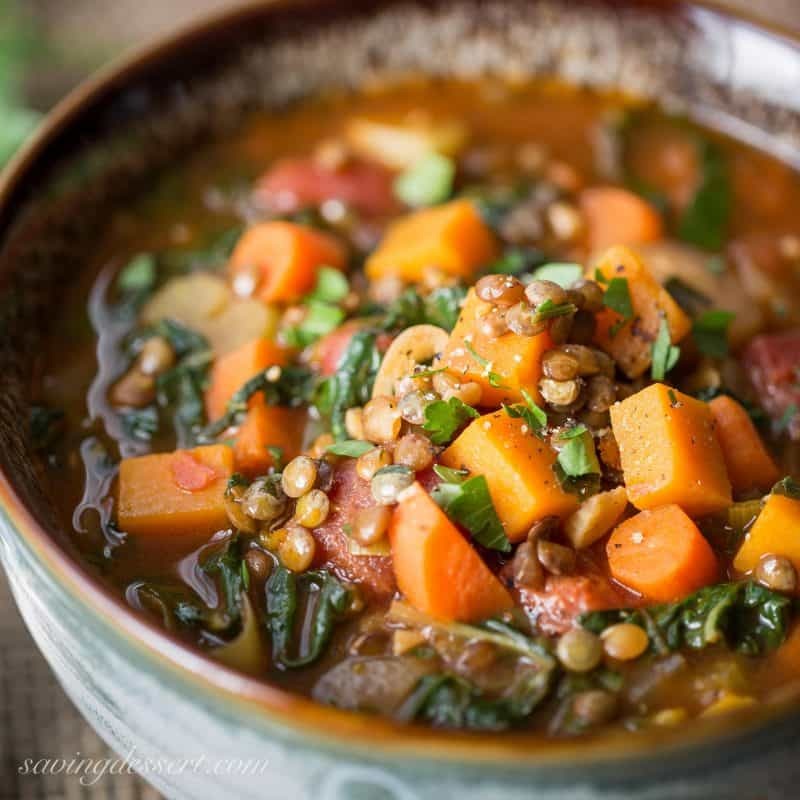 This delicious Vegetable Soup with Lentils & Seasonal Greens is proof that you don’t have add meat or give up flavor to eat healthy. A pinch of cayenne rounds out the broth so no need for lots of salt. Serve with a hearty rustic loaf of whole grain bread for the perfect winter meal. Drizzle the olive oil in a large soup pot or dutch oven with a heavy bottom. Heat on medium until hot. Add the chopped onion and garlic and sauté until the onion is softened. Add the leek, celery, carrots, butternut squash, white portion of the Bok Choy and the lentils. Stir gently to coat all vegetables in the olive oil then add the vegetable stock and chopped tomatoes. Season with salt and pepper. Cover the pot with a lid and gently simmer for about 15 minutes. Add the tomato paste, chopped greens, parsley and thyme. Heat until the greens are just tender. Garnish with fresh parsley and black pepper. 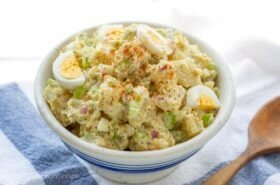 Serve with a hearty whole grain bread if desired. The soup is easily adaptable by substituting rutabaga or turnips for the butternut squash. Use seasonal greens such as Swiss Chard, Kale, Cabbage or Spinach in place of the Bok Choy if desired. Be sure to cut vegetables about the same size so they will cook more evenly. All the decorations are packed away for another year. The cold weather has finally come to Virginia so it’s starting to feel more like winter. We were downtown yesterday and saw a Forsythia bush in bloom. They are always the first to bring flowers in spring but I’m afraid they will freeze this week. It felt like spring for a while 🙂 Hope you have a wonderful New Year! Thanks so much for stopping by! Previous Post: 2015 – Top 10 favorites! Do you have nutritional info for the portion size?? Hi Debbie – If you are trying to make the soup ahead of time, I would omit the greens, and add the just before serving. I think leftovers will freeze just fine, but I haven’t tested freezing this soup. We always end up eating it until its gone. Thanks – hope you enjoy! I made this today for the first time, and added more butternut squash than what it called for, and just dropped in sprigs of thyme at the beginning and added more at the end. It was Delish! Thank you Joy! Adding more butternut squash sounds like a great idea and I adore thyme – so I’ll have to try that too! Thanks again for the feedback. I adore this soup and so happy you liked it to. Have a wonderful holiday season and Happy Thanksgiving! Oh the bacon sounds wonderful! I love this soup and can’t wait to have it again – I think I’ll try the avocado too! Thanks Marisol! This soup is knockout! I’m a beginner cook – just finished class #2/3 of “Beginners Cooking Boot Camp” – and this seemed worth a try, lots of things to do. Glad my instructor taught be how to chiffonade. I did everything as directed except extend simmering time to get the vegs a little stew-like. This is now one of my g0-to recipes. Thank you so much! Thank you Jeffrey! I feel the same way about the soup and love trying it with swiss chard, cabbage or spinach too. Thank you very much for letting me know! Have a wonderful week. I haven’t really cooked in quite awhile, but I made this soup tonight, and it was the best thing I could have done for my family. We loved it! And it inspires me to keep cooking. 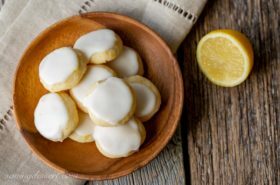 Homemade is always the best – thank you so much for commenting Lisa. I am thrilled your family liked it. I think it is delicious and this time of year I can’t get enough soup! Thanks again for commenting and reading SRFD! Try adding the tomatoe paste while other veg are sautéing. Gives it a deep rich flavor that really knocks this outta the park. Thanks! Lentil soup is the best! 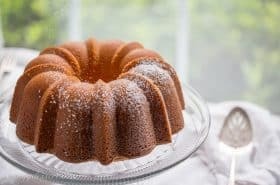 Just made a delicious old-favorite recipe for me and my husband last week. Love those beautiful big chunks of butternut squash in yours, Tricia! This weather just begs for soups and stews. Chunks of vegetables always make me happy! Lovely! It’s that time of year for soup – and we are on a mission to make them this month. Yours is so good – we can practically taste it right from your photos! Yummy Tricia! Have a great weekend! We eat loads of soup at this time of the year. So this is perfect for us! Love greens in legume/pulse soups — so much extra goodness and flavor, and they also add wonderful color. Thanks! And Happy New Year! Me too John! Hope you and Mrs. Riffs enjoyed your holiday break – glad to have you back! Happy New Year! We make a similar version of soup, I like your recipe much better. Well that is sweet Amy! I bet your soup is great 🙂 Don’t you just love vegetables and lentils? I just feel better eating healthy! This is a great soup for this chilly weather now, Tricia! I use smoked paprika every chance I get, love the flavor of it. Thanks for sharing! I’ve eaten it for three dinners in a row and am still not tired of it – thanks Becky! It is soup weather here and there’s nothing better than a pot of lentil soup simmering on the stove. We are able to get unprocessed bacon and ham at Whole Foods. I agree that the smoky paprika is a delicious substitute!! I do like the nitrate free products but save that for super special occasions 🙂 Hope you had a lovely holiday! A great start to 2016, Tricia! That is one bountiful, hearty, beautiful bowl of soup. It is finally cold here, too! I wasn’t complaining but this does feel a bit more normal this way even if I’m freezing. Hope you had a nice NYE evening out…and here’s to a great new year! Our NYE friends canceled on us! Can’t say that I lost any sleep over it 🙂 It was nice to snuggle down at home! Thank you so much for stopping by! There’s nothing blooming here 😉 While we had a green Christmas (very unusual), the week or so after Christmas has made up for it, with lots of snow and cold. Perfect soup weather though, so I’m loving this one! We live on soup in the winter, so can’t wait to try this. This weather is crazy! Hope you dig out soon and hope you had a very Happy New Year! Hi Tricia, your soup looks wonderful, I love lentils they are my favorite. Just packed the rest of my Christmas stuff today too, wishing you the best! This looks fabulous! Great soup for a blustery January day. I see this on my table soon. Thanks. Your soup makes me hungry, just looking at it! And I’m a big fan of smoked paprika – I use it any time I can. Thanks Beth! This is a filling and satisfying soup – great this time of year. Enjoy! Looks so very comforting and delicious, Tricia. Love your soup bowl too. 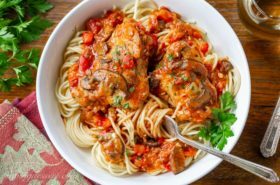 Thanks Angie 🙂 It is a tasty, healthy and filling dinner on a cold winter day. I think sometimes our cravings (probably not the chocolate/brownie ones) tell us what our body needs. 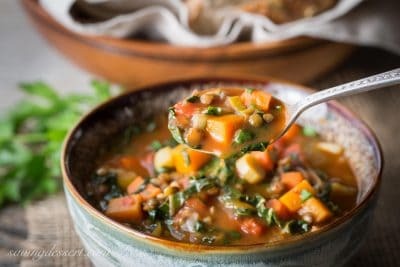 This soup is exactly what I crave after days and days of rain and cold here in St. Louis! A beautiful bowl of warmth and flavor! I have several bags of lentils in the cabinet waiting to be part of this soup. You are so right Wendy and I needed this soup! Have a wonderful week. This hits the spot for a cold Sunday in January — I love your idea of using smoked paprika to substitute for the meaty flavor, it’s one of my favorite spices. As for lentils, Grant is mad for them, so this is on the list for next week!! Yum, his looks so good Tricia! I love all the beautiful veggies. 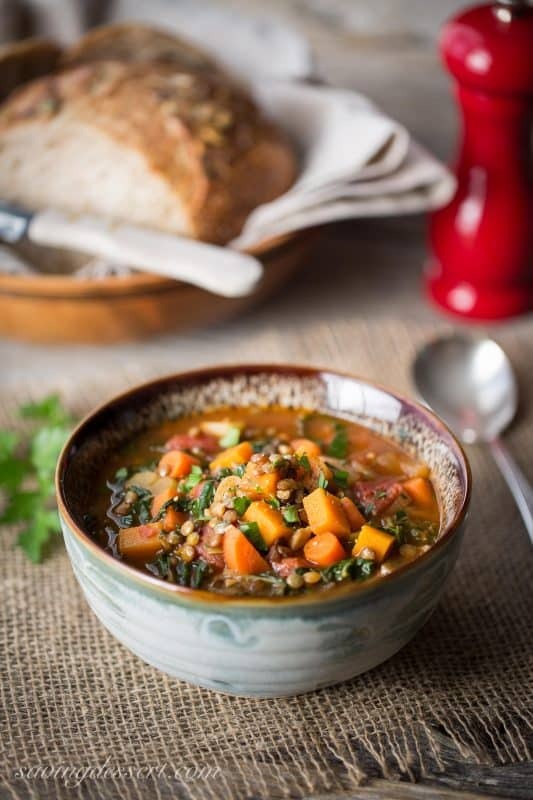 Our daffodils are starting to peek up after the two weeks of unseasonably warm weather (sad) but now it’s really cold and this soup would be fantastic for lunch or dinner! 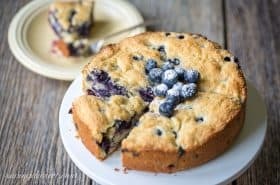 Don’t tell anyone but I’d even enjoy it for breakfast! Thank you Chris! Crazy weather – our tree in the front yard is starting to leaf 🙁 Hope it recovers from the upcoming cold snap. Have a lovely week!